Immunogen: Native human Cu/Zn SOD. 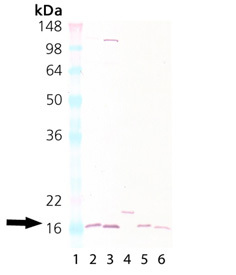 Application Notes: Detects a band of ~23kDa (human) or ~19kDa (mouse and rat) by Western blot. Purity Detail: Protein A-affinity purified. Formulation: Liquid. In PBS containing 50% glycerol and 0.09% sodium azide. Scientific Background: Superoxide dismutase (SOD) is responsible for the elimination of cytotoxic active oxygen by catalyzing the dismutation of the superoxide radical to oxygen and hydrogen peroxide. There are three SOD isoenzymes in mammalian cells: extracellular SOD (EC SOD, SOD-3); copper and zinc-containing SOD (Cu/Zn SOD, SOD-1); and manganese-containing SOD (Mn SOD, SOD-2). The Cu/Zn form binds Cu and Zn ions and exists as a soluble 32kDa homodimer in the cytosol. Mutations in the SOD-1 gene accounts for approximately 20% of amyelotrophic lateral sclerosis (ALS) or ‘Lou Gehrig disease,’ a neurodegenerative disorder characterized by the death of motor neurons in the brain, brainstem, and spinal cord that results in fatal paralysis. Western Blot Analysis of Cu/Zn SOD: Lane 1:MWM Lane 2: Rat liver tissue lysate, Lane 3: Mouse liver tissue lysate, Lane 4: HeLa, (cell lysate) (Prod No. ADI-LYC-HL100), Lane 5: Brain (mouse), (tissue extract) (Prod No. ADI-LYT-MB100), Lane 6: Brain (rat), (tissue extract) (Prod No. ADI-LYT-RB100).